Also Recommended: Area 88, Captain Harlock. Notes: Based loosely on the manga "Hikoutei Jidai" ("Age of the Flying Boat") by Miyazaki Hayao. After the end of the first World War, Porco works as a mercenary pilot, taking on missions for payment from his hidden base in the Adriatic Seas, where he mostly goes up against the rise of sea pirates operating in the area. At the same time, facism is on the rise, which makes finding work harder and harder. Back when I was a mere lad, I used to have a keen interest in planes. Maybe not necessarily from a historical or theoretical viewpoint, but I would often borrow books on the subject in the library, plus TV shows and videogames featuring aircrafts would also rank highly with me. Which is probably part of the reason why Porco Rosso is my second favorite Miyazaki movie, right after My Neighbor Totoro. Maybe it's just the part of me that responds so well to the whole "flights of fancy" that permeates this movie. Despite the fact that Porco Rosso is the only of Studio Ghibli's movies that takes place in an actual historical setting, even one caught between two of the best known wars this world has faced. Well, at least seen from the viewpoint of an European citizen like me, and the whole recent situation in the middle east not taken into consideration, at least not at this point. But I'm not here to talk about politics anyway. I'm here to talk about a movie that, for all its political posturing, is mostly about a man who chose to walk the path outside current world events by basically turning into a pig. In some ways, he's slightly reminiscent of another famous anime personality that, ironically enough, turned to piracy himself. Well, at least to some extent. More importantly, Porco Rosso treats its own subject matter with a sense of free-spirited playfulness. Part of this is because the sea pirates Porco faces -- on a regular basis, it would seem -- are a bunch of goofballs at heart. The movie opens with them kidnapping a bunch of children to hold for ransom, and proceeds to show how they exhasperatedly try to prevent them from crawling all over the place as they fly away. Porco Rosso carries with it none of the darker sentiments from other Ghibli movies, like Nausicaa, Princess Mononoke or Tales from the Earthsea. Most of the characters, particularly the men, are caricaturish in designs, ranging from the somewhat Bluto-ish sea pirate to Porco himself as an antromorphic pig. Its tone is closer to Castle in the Sky, or even Kiki's Delivery Service rather than any of the earlier mentioned movies from the same studio. As far as I can tell, none of the actual planes is based on any real-life models, but the movie still treats them with a sense of realism that borders on admirable. For all its cartoonish goofiness, the flight sequences are downright spectacular to behold, even if many of them are basically just fly-bys in the gorgeous renderings of the Adriatic Seas and the many islands scattered around the area. And barring the dream-like sequence in the middle of the movie, the handling of the flight sequences are still as true to life as you'd expect from anything centered around planes, even those designed for aerial combat. While Porco Rosso has a good, if simple, story to its name, I would have watched this movie for the flight sequences alone. Another reason to love this movie is also the characters. Porco himself actually breaks the mold of general action heroes by being an adult in a medium that more often than not caters to teenagers and their dreams. He's developed a bit of a pragmatic bent, probably because of what happened to him in the past and how it links up with what's going on in his own home country. While it might be a bit hard to peg his moral stance at first -- mostly because he doesn't seem to mind there being sea pirates around since they provide him with the opportunities for work -- he's nevertheless a honorable man at heart. Whenever he's not out on a mission or waiting for one on his secret island base, he can be found in the hotel and club for sea planes found in the local area, run by an old aquaintance of his; Gina. The first time we see Gina, she's singing a lovely cabaret song in her own hotel, the Adriano. As we soon learn, her place is basically open for everyone to drop by and take a load off, as long as they don't bring work there. This does include the aforementioned sea pirates, who sit around one of the tables like a bunch of mafioso and can barely restrain themselves from going postal on Porco whenever he enters. When we do see her, we learn that she's just lost another pilot husband to the war, and she's understandably concerned about Porco, especially now that the facists are rising to power. The other main female character in this movie comes in the form of Fio, a young girl more in line with what you'd find in most Ghibli movies. She's aiming to be an airplane designer, and, as such, she's basically thrown into Porco's life after a bit of an event in the middle of the movie. Compared to the calm, collected and methodical Gina, Fio is a bundle of energy, and a very thorough one at that. In many ways, she's a poster child for the whole situation during wartimes, where women had to step up and take the place of men in various work-related situations you'd normally not find women considering the era of which the movie took place, a role she takes on together with the rest of her family. Or, well... the women in her family, an interesting group by themselves. Fio eventually wins Porco over despite his initial scepticism. Last in the main lineup is Donald Curtis, a man with an attitude and ego as large as America. Hungry for fame and fortune, he strides broadshouldered into the movie intending to challenge Porco to a duel in the air. He's already a celebrity at home from being a movie star AND a pilot ace, and as soon as he steps into Gina's hotel, the duel and the future presidency in the United States isn't the only thing on his mind anymore. I'm not sure how much people are going to appreciate how pirates and the war situation are portrayed here, especially given how much more brutal either of them are in real life. Although it should be pointed out that Porco Rosso takes place outside of the whole spectacle that eventually became the second world war, which, in spirit with the main character, is exactly the point the movie was trying to make. (At least, that's how I saw it.) 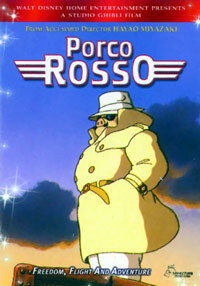 And while I'm certainly not against war movies or movies featuring piracy or criminality in itself being put in the correct light, I can still appreciate something like Porco Rosso, who seems to have more fun on the subject while still having a satisfactory amount of respect for the subject itself. Recommended Audience: There isn't too much overtly objectionable in this movie. There is some very mild profanity, some cartoon-style violence, and a brief shot of some schoolgirls skinny-dipping that really isn't even worth mentioning. However, kids will probably not appreciate this film because of the slowness and flavor of the pace and the lack of high action. Okay for most audiences, though.